Audio visual technology is a very powerful artistic tool. Just look at the amount of modern art that has been created with multi-media technology. For many artists it has replaced the canvas and brush as the physical means by which to express oneself. These days many artists are also technicians, able to manipulate sounds and images in order to express their artistic vision. In Classical aesthetics there is a distinction between ‘mimesis’ or showing and ‘diegesis’ or telling. The precise meaning of these terms has changed over the years but we can make use of the distinction here to look at how audio visual technology enhances the art of celebration. To simplify, audio corresponds with telling and visual corresponds with showing. The art of celebration involves an interplay of showing and telling. Probably the best example of this interplay is a rock concert. We might consider U2’s Zoo TV tour which took place in the early 90s. The visual spectacle of the huge video screens and the way they interacted with the music was powerful and unprecedented. You might argue that the music video had been done before but the experience of watching a music video on MTV is a private one and very different to the shared experience of a celebration, which a rock concert essentially is. I remember in the late 90s going to a nightclub where a film was projected onto a large screen with the sound muted. There was no deliberate thematic relation between the music played by the DJ and the film but they seemed to spark meanings off each other in a random way. Anyone watching the images on the screen couldn’t help but make connections with the music. So, in audio visual technology the visual is provided by a projector or flat screen and the audio by a DJ or a band playing through a sound system. As for what you play on the projector or flat screen the options are limited only by your imagination. Conventional uses would be a film of a wedding played at the wedding afters or a slide show of pictures for a birthday boy or girl. A more creative use would be to make your own movie to run alongside the music and thereby destabilize and play with the meaning. In the context of the music the film will take on a life of its own. Another way of putting it is that the combination of music and images has a power of suggestion and this is heightened in the context of communal celebration. These days almost anyone can be an artist if you have the right tools. Some call this dumbing down but it is fairer to say that it is a democratisation of art. What better qualification to become a citizen of this world than to be an artist: someone who can give life meaning and, of course, in the process, throw a good party! 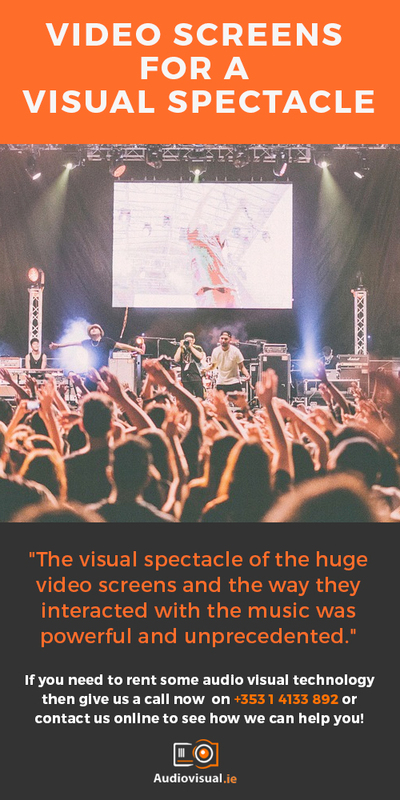 If you want to create your own audio visual experience, be it for a birthday celebration, an art installation or a business event we have the AV technology you need to make sure your event is a success. Give us a call now on +353 1 4133 892 or contact us online to see how we can help you!